The perfect combination of accuracy, performance, and durability. 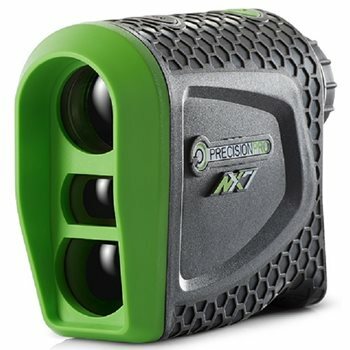 The Precision Pro NX7 Laser Rangefinder features (TAG) Target Acquisition Technology to ensure you get accurate distances to the target, not what's behind the target. The compact design and ergonomic no-slip grip increases steadiness in your hand, reducing vibrations for a steady viewing experience. The extended 2-Year Warranty means your product is covered and Precision Pro's free battery replacement service ensures you'll never run out of power. Really good rangefinder- - pro version includes slope capabilities- showing both distances with and without slope calculation. Precision Pro also gives you a free battery for life(new battery every year- just email and get it in 2 days). Purchased through Global Golf - as always top notch company with top notch staff- only way to go for golf equipment. Works very well. Extremely accurate and a great value. Good Range finder and almost accurate for yardest, but no elevation. I should bougth the NX7 Pro but for the price you can beat it.